Whether at work or home, but we are under constant requirement of communicating the content, value and purpose of work to our colleagues or family members. Projectors can be of great help in such cases as they provide us with the big screen experience which can cater to a room filled with users. But while purchasing a projector, you need to be extra cautious about its features so that the projector can be in sync with your specific requirements. Today we are going to take you through some of the best projectors available in the market. But first we will take a look at the basic attributes which a projector needs to have for making its mark. This refers to the set of filters, mirrors and lenses which transfer images to the screen from within the projector. Poor optics can thus render dull or blurry images in a way similar to a cheap pair of binoculars. Optics can turn straight lines into curves thus distorting the image and making sharp edges indistinct and rough. The problems of bad optics get worse coupled with increasing size of the room and image. 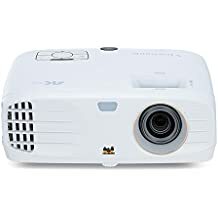 Modern day projectors come with stellar optics and you can examine the same easily by projecting a grid of lines and seeing if it looks straight and sharp. The basic function of a projector is to convert a small image into a larger one for allowing a bigger batch of people to see the same. Certain quantum of light is required to trigger the sensors present in human eye which in turn changes in sync with the size of the screen and overall light present in the area. For projecting an image spread across eight feet in a darkened room, it is necessary for the projector to have an output of 1000 lumens which shoots up to 2000 lumens on the presence of ambient light in the room. The accuracy of color needs to be spot-on for helping you experience true-to-life images. Since the projector mirrors the exact image of your computer or tablet screen, you surely would not like it to reflect purple hues when the computer shows light blue. Color clarity and color fidelity are two pre-requisites of producing a good image. This refers to the number of pixels in vertical and horizontal dimensions. However, if your computer monitor can support a maximum resolution of 1024*768 pixels, mirroring the same in a 1400*1050 projector might cause the image quality to degrade. The “extra” pixels are created through interpolation of the original pixel values which in turn can blur the edges and create a less attractive image. Thus, it is ideal to always match the projector resolution along with the resolution of the screen you require on your computer monitor. Having zoom lens can be of great help in exercising utmost flexibility ahead of the home theater screen. A large zoom ratio offers you with more wiggle room. However, excessive usage of zoom can accentuate chromatic errors present in the picture. 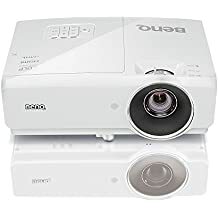 It is always advisable to proceed with a projector having large zoom and large lens since that will succumb to lesser errors when compared to a smaller one. It might not always be possible to get the perfect mounting position both for the projector and screen. Given such a scenario, modern day projectors are being stocked with lens shift feature in both vertical and horizontal directions. You can now move your lens left/right and up/down once it has been mounted for being aligned perfectly with the projector’s image on the screen. Home theater projectors come stocked with an array of moving parts ranging from color wheels, cooling fans to motorized iris controls which can join hands to churn out a lot of noise creating a lot of distraction in a quiet and suspenseful movie moment. Thus, you need to enquire that your projector does not emit much noise so that you can make the most out of your big-screen experience whether at home or work. The Optoma UHD60 has been accredited for delivering state-of-art 4K quality graphics which can take your big-screen experience to a whole new level. Razor sharp images are delivered with the stellar resolution of 3840*2160 which lights up the screen with the maximum pixel resolution of 8.3 million. HDR10 image technology enables luminous whites, deep blacks in the REC2020 colors space which can easily match up to the color displayed in film production and television. You can enjoy crystal clear imagery seated at a distance of 10 feet from the UHD60 projector whereas you can enjoy optimum picture quality when seated within a distance of 5-6 feet from an average television. The DLP chip system paves the way for easy set-up and perfect convergence given its inherently alignment-free nature. Throw ratio of 1.39 to 2.22 and 1.6x zoom along with vertical lens shift allows easy and flexible installation which can suffice various spaces and screen sizes ranging from 140” to even more. The UHD60features a robust LED lamp which can suffice for a stretch of 10000 hours when running on ECO mode and 15000 hours on Dynamic mode. Its 4W stereo speakers can churn out loud and crisp audio which is bound to delight you to the core as you make the most out of your audio-visual experience. Standard PC power cord helps in tackling voltage issues. Does not require any professional calibration. Large number of input and output options. Comes with a lens cover. Does not emit any noise. Lacks keystone adjustment making it imperative to proceed with the placement after adequate planning. You can easily discover exciting premium content using the LG’s exclusive Smart TV platform of the PF1000UW projector which ranks high on its user-friendly attribute. Fast navigation gets promised through its accompanying remote which also makes it a lot more fun while projecting big-screen visuals. Vivid imagery gets delivered by this Ultra Short Throw projector at exceptionally short distance from the projection surface. You can either take your pick between 60 inches of vibrant viewing by setting the projector at a distance of 5 inches or place it further away to experience 100 inches of visual extravaganza. The Full HD 1080p picture quality delivered by the PF1000UW projector coupled with a stellar contrast ratio of 150,000:1 and 1000 lumens of brightness can help you in enjoying theater experience while being seated within the four walls of your home. Natural and rich light is displayed by its LED light source which can last up to a stretch of 30000 hours. Thus, you can make the most out of this projector by using it over 10 years with 8 hours of average daily usage. Audio gets streamed directly to a Bluetooth compatible sound system like headphones, audio speakers or portable speakers. Ultra-short throw projector offering the big screen experience by placing the projector at a distance of a few inches from the wall. Lightweight and highly portable device which can be moved around seamlessly. Retains its brightness even in a room having ambient light. Operating system might seem to be a bit slow in loading content. The ViewSonic PX800HD can serve as the ideal home entertainment option with its razor-sharp images and bang-on color accuracy. 100% Rec. 709 color precision is delivered by the exclusive RGBRGB color wheel which paves the way for true-to-life colors which was till date the exclusive aspect of movie theatres. 2000 lumens of brightness aid the projector in producing bright images irrespective of the environment so that your entertainment game stays strong at all times. Optimized color in both dark and light scenes is delivered by the ISF (Imaging Science Foundation) Certified Day and Night modes. ISF technicians can also provide on the spot tuning of these settings for making the most out of customized image calibration. A four times higher contrast ratio is achieved by the optional BrilliantColorPanel in comparison to an average projector screen which can teleport you to the action scene with its delicate color shades and immersive images. The flexible and simple set up of this ultra-short throw projector helps in using the same even in small rooms by being placed at a distance of just few inches from the wall. You can discreetly stream multimedia content wirelessly or connect other devices through the HDMI cable coupled with the exclusive PortAll feature of the ViewSonic PX800HD. The three HDMI ports can even display 3D images directly from 3D Blu-Ray players thus taking your entertainment game a notch higher. Ultra-slow input latency of 16ms provides faster frame-by-frame action and smooth visuals devoid of any delay. Built-in 10W speakers can complement your home theater experience with room-filling audio. Supports an array of media players, Macs, PCs and other mobile devices through HDMI 2.0, HDMI 1.4 etc. Industry leading 3-years warranty on limited parts and labor coverage as well as a year’s warranty on lamp coverage. Lacks real screen size zoom capability. You can now make your presentations shine with 6000 lumens of brightness as the Optoma X600 delivers ultra-sharp visuals having excellent color accuracy. The bright XGA resolution is vibrant enough for being used in medium to large rooms having ambient light such as classrooms, meeting rooms and lecture halls. The Optoma X600 can exercise over the network control and management of 250 projectors with its Crestron RoomView feature which makes it the perfect choice for both educational setups and business houses. This custom configurable interface aids in monitoring, managing and controlling every single device present in the room remotely from any computer. You can alter the projector settings through a simple web browser page along with OSD menu control. Even mail alerts can be set up for warning message. A wide array of computer and video input signals is accepted by the native XGA projector including DVI-D, HDMI, S-Video, dual VGA, RS232, RJ45, VGA-Out and +12V trigger. The X600 can also serve as a volume controller and audio switcher coupled with the dual audio inputs meant for video connections and individual PC thus eliminating the requirement of costly additional cabling and audio hardware. A stunning contrast ratio of 10000:1 paves the way for crystal clear text and pin sharp graphics making it tailor-made to conduct presentations. You can monitor the X600 over LAN by providing the user with an email message alert if the lamp fails, requires replacement or on occurrence of errors. A six-segment color wheel is featured by the multi-color processing system of the Optoma X600 which comes with an advanced dichroic coating for achieving color accuracy and saturation. Brings 75% savings in energy consumption over regular standby mode by using less than one-watt power. Uses lead-free components on all printed circuit boards for diminishing the environmental footprint. Texas Instrument BrilliantColor Technology helps with advanced color processing. The Full HD ultra-short throw projector from Optoma can be your ideal option for sports, movies and gaming as the delightful combination of 25000:1 contrast ratio and 3500 lumens of brightness can set the stage for a mesmeric audio-visual experience. Images ranging up to 100” gets projected onto the wall or mounted screen by placing the projector at a distance of just 13” without the requirement of any specialty mounts. You can thus simply place and play without the requirement of expert room placement. The 100% field view offered by the Optoma GT5500+ which does not create the requirement of zooming prior to engaging can be of great help in playing the latest PS4 and Xbox One titles which might involve challenging opposing players in gaming marathons. An array of connectivity options including VGA-In, dual HDMI, dual Audio-In and many others are featured by the GT5500+ which is bound to expand your potential while playing your favorite content on the big screen. True 3D content gets displayed by the Optoma projectors from almost all 3D sources including 3D broadcasting, 3D Blu-ray players and latest generation gaming consoles. 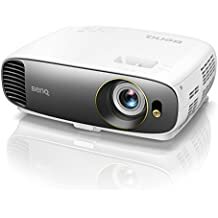 You can also enjoy smooth and flicker-free images which can impart a whole new level to your movie viewing experience coupled with the projector’s support for a rapid refresh rate of 144Hz. Excellent brightness which retains its vivacity even during daytime. Offers simple plug and play setup. Fan emits a lot of noise. The UI interface is not very intuitive. Make your screen radiate 4500 ANSI lumens of brightness with the BenQ MH750 Full HD projector which enables comfortable lights-on presentations for promoting collaboration, discussion and note-taking in meeting rooms having around 20 participants who can clearly view the slides irrespective of their seating position. The pixel fill factor and industry-leading contrast of the BenQ projectors pave the path for unmatched readability wherein every single character, chart and graph gets crisply defined. The high fill factor diminishes eye strain of both presenters and audiences while enhancing the level of clarity for black and white as well as colored images. 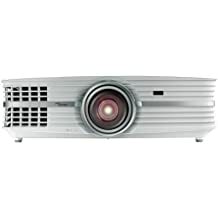 The high resolution projector offers enhanced productivity which can cater to professional grade presentations. Wireless solutions are integrated by the BenQ projectors to maximize mobility and presentation freedom especially when projecting in a large room. While static picture mirroring is supported by an optional wireless dongle, wireless presentation requires the backing of an optional QCast Mirror dongle and QCast. The image gets adjusted automatically by the vertical keystone function for a professionally squared image whereby you can project ideally aligned images from an array of locations. Each of the four corners of an image gets adjusted independently by the Corner Fit option which can serve as a convenient and flexible means of aligning perfect pictures. Its built-in 10W speakers eliminate the requirement of external speakers by delivering crisp and clear audio output. Image can be reversed for rear projection. Projector can be ceiling mounted through the accompanying screws. Vertical and horizontal keystones are perfect for positioning the projector at the corner of the room. Retains its brightness even with lights on. Can output audio to an external amplifier. Built-in qcast application aids in easy linkage and usage through the BenQ dongle. The projector fan kicks periodically emitting extremely loud noise. The BenQ TK800 home entertainment projector has been specifically built for those who are on the lookout for a better alternative to 1080p projection for carrying out 4K broadcasting, gaming and movies in a seamless fashion. The unusual color choice of the projector can remind us of a seventies Christmas decoration which is bound to turn heads as you carry it around the room. The optical system features focus wheels and zoom with all the inputs placed on the rear and menu navigation controls placed on the top surface. This large device can be used for either rear or front projection after being ceiling mounted or placed on a table. The accompanying remote control features backlit keys and significantly more buttons than what is present on the projector body. Dual HDMI ports, a RS232 12V trigger, 3.5mm audio jacks (both in and out) and VGA are the available connectivity slots however VGA does not support 4K resolution. Only the HDMI 1.4 input slot supports 4K resolution at 60Hz while the other cannot suffice for more than 30Hz. This creates the requirement of a HDMI switcher for connecting multiple cables, consoles, computers and Chromecast Ultra with the projector simultaneously. The Type Mini B USB port is earmarked purely for service diagnostics whereas the Type A provides power to Chromecast or similar connections. Produces stunningly lifelike video having 8.3 million pixels. Brightness and contrast gets enhanced with automatic HDR natural color rendition and one-step image optimization. Five customized picture modes including Sport, Football, Vivid TV, Bright and Cinema for enhancing the visual experience. Auto vertical keystone function which counters the trapezoid effect. Available space gets maximized by 1.2X zoom allowing diverse placement and mounting options. It is not a short throw projector. The RGBRGB color wheel and CinematicColor technology of BenQ can easily cater to the industry’s highest standards for delivering stellar visuals which is bound to delight you to the core. The exquisite convergence of 8.3 million pixels pave the way for true-to-life 4K UHD performance having more than 96% coverage of the Rec.709 color gamut. The Cinema-Optimized technology and exclusive Auto HDR Color Rendition of BenQ offers greater contrast range, brightness and image optimization in a single-handedfashion thus bringing out every minute detail in 4K video content which serves as the pre-requisite of superior cinema enjoyment. The single DMD DLP technology aids in avoiding inherent alignment issues while dealing with multiple panels. This also ensures razor-sharp images having accurate colors and immaculate clarity devoid of interference patterns, shadowing and blur. 1.2X zoom helps in making the most out of the available space coupled with a range of throw distance to aid with diverse placement and mounting options which can easily turn any space into a home theatre. The vertical keystone function tags along a professionally squared image by countering the trapezoid effect. You can thus project ideally aligned images from an array of locations in a simple manner. The SmartEco technology of BenQ projectors aid in automatically adjusting lamp brightness for projecting richer blacks with enhanced contrast level. The projector lamp life gets further accentuated to 150000 hours when operating on the LampSave mode which in turn can minimize the overall cost of ownership. One of the least expensive 4K projectors available in the market. Backlit remote control features an array on direct-access keys. Weighing at 10 pounds, the BenQ projector is portable enough for being carried around easily. Robust on-board 5W speaker having impressive dynamic range. Difficulty in focusing across the entire screen. 3D settings have to be configured manually. The lightweight and no-fuss projector from the house of Epson can project crisp visuals even in the presence of ambient light. Your videos are bound to pop whether you take it to the backyard or airy open-concept living room. Weighing at around 10 pounds, the video projector cannot exactly be termed as an ultra-portable. But it packs in a bevy of features which bring about large-scale projection coupled with convenience and clarity. 4200 lumens of brightness can offer up to three times radiance in comparison to its peer models. Full HD 1080p visuals pave the way for larger-than-life and extremely sharp visuals whether you are streaming your favorite Netflix series or watching the sports finale. Coupled with a throw ratio of 1.57, the Epson HC1450 can project a 260 inches’ screen from a distance of 29 feet. Its split-screen video output capabilities can easily turn the projector into a peacemaker when the cricket finale clashes with the soccer qualifier. Its 16-watts speakers are loud enough to fill up a medium sized room in enthralling audio waves. 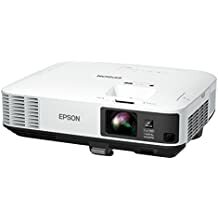 The low-cost replacement bulb of the Epson projector can last for a stretch of 5000 hours or even 10000 when used in Eco mode. Unbelievably bright visuals making it a perfect choice of being used in a well-lit room. Features an array of connectivity options. Quick corner feature makes it easy to fit the picture on the screen. Comes with a convenient and easy to operate remote control. Projector might get heated after continued usage. Fan is extremely loud thus distracting you from making the most out of your movie viewing experience. You can now enjoy incredible cinema experience while being seated at the comfort of your house with the ViewSonic PX727-4K projector which delivers stunning 4K Ultra HD resolution coupled with incredible cinematic color without crossing over the budget threshold. Its DLP chip having XPR technology delivers 3840*2160 pixels which can decode HDR video signals. With such amazing image reproduction, the ViewSonic projector can display true to life videos for bringing about an immersive viewing experience. 96% coverage of the Rec. 709 color space is delivered by the projector for providing jaw-dropping compatibility and vibrant color which was till now earmarked exclusively against the movie theaters. 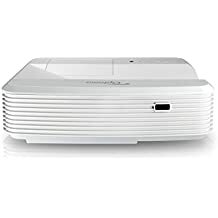 You can connect the projector through its dual HDMI inputs with an array of HD devices such as laptop PCs, Blu-ray players, digital cameras etc. The highly-powerful side mounted 10W speaker paves the way for an immersive multimedia experience by combining screen performance along with room-filling sound. The backlit remote control features well-lit buttons which help with night-time viewing and usage in dark scenarios. The 1.2x zoom lens of the PX727-4K loses a paltry 3% at telephoto end when compared to the wide-angle end so that you don’t have to worry about the end of the zoom which you are using. 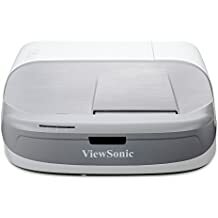 Along with an input lag of 53 ms, the ViewSonic projector can serve as the perfect pick for casual gaming although professional gamers might feel the requirement of a faster unit. Fantastic resolution which can make the colors pop. Does not require complicated calibration or settings changes. Optical zoom function aids in utilizing the existing ceiling mount without the requirement of relocation. Picture retains its visibility in a room having ambient light. Supports an array of media players, PCs, gaming consoles, Mac and mobile devices through input options like HDMI 2.0 with HDCP 2.2, HDMI1.4 with HDCP 1.4, USB etc. SuperEco mode keeps the lamp shining for 15000 hours. Renders support to HDR content. Fan noise might seem to be distracting at times. Coupled with the right setup and environment, a large number of projectors can cater to your expectations. Most of the middle to high-end ones will have roughly comparable image quality and brightness. 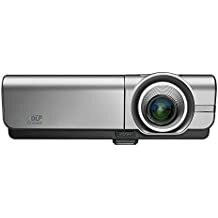 However, your end selection might also be driven by an array of other factors such as the requirement for a handheld remote, choice between portable desk projector or ceiling-mounting fixed projector etc. 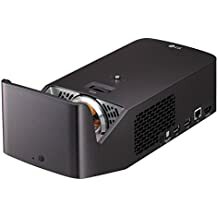 Most of the home theater projectors come coupled with an array of technologies such as LCos, DLP, LCD and SXRD with each using a different set of lamps.